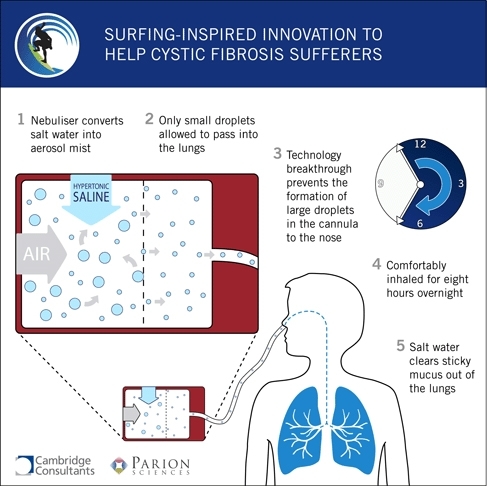 Observing surfers with cystic fibrosis (CF) led scientists to discover that the inhaled mist of seawater has a therapeutic effect on the lung problems associated with the disease. Now the findings have been used by pharmaceutical company Parion Sciences and product development firm Cambridge Consultants in a new aerosol delivery system. It enables CF sufferers to get the benefits of saltwater treatment in their own homes overnight while they sleep. CF is a chronic disease that affects the lungs and digestive system of more than 70,000 adults and children worldwide. Studies have shown that the inhalation of a hypertonic saltwater solution improves the condition of sufferers by rehydrating the layer of mucus film that lines their lungs. Cambridge Consultants conducted human-factor studies and developed a system that could deliver an aerosol mist through the nose continuously for eight hours. In a statement, Matthew Allen, programme director at Cambridge Consultants said, ‘We immediately recognised the potential of this project to transform the lives of CF patients. ‘The challenge was to build an aerosol nebuliser system that could be comfortably used by patients overnight – with the saline mist travelling down a long cannula to the sleeping patient without forming the large droplets that often occur in a standard nebuliser system. The tPAD (trans-nasal pulmonary aerosol delivery) device has been assessed in a clinical trial – and additional devices have now been requested to support further clinical trials. The aim is to provide an easy and effective treatment system for CF patients that is suitable even for young children and allows the disease to be treated at the earliest possible stages. does it also help people with lung cancer?